The holiday season is often thought of as the time leading up to Christmas, but that’s far from reality. It actually starts in the middle of October when it’s time to RSVP for Halloween parties and make adjustments to your little ones costumes. That’s where the often crippling stress of the holiday season starts, but certainly not where it ends. Before you know it you’ll be spending hours baking for Thanksgiving, rushing to get Christmas gifts, driving for hours on end to the various get togethers you’re expected to attend, and deciding where you want to be when the clock strikes midnight and takes us into a fresh and shiny new year. This causes more stress than most of us are equipped to handle. In fact, forty-five percent of Americans would prefer to skip the holiday season all together, with nearly a quarter of us reporting “extreme stress” during this supposedly blissful time of year. This led me to ask myself what, in specific, is causing this stress epidemic and what I found made perfect sense. The statistics show that 69 percent of people are stressed by the feeling of having a “lack of time,” 69 percent are stressed by a “lack of money,” and 51 percent are stressed out about the “pressure to give or get gifts.” Not to mention the physical implications. Stress is known to cause headaches, fatigue, aching muscles, lower back pain and a loss of appetite. Think it doesn’t affect your work? Think again. It’s been scientifically proven that stress causes difficulty concentrating, low job satisfaction and morale, changes in behavior while at work, and a decline in productivity and work performance. 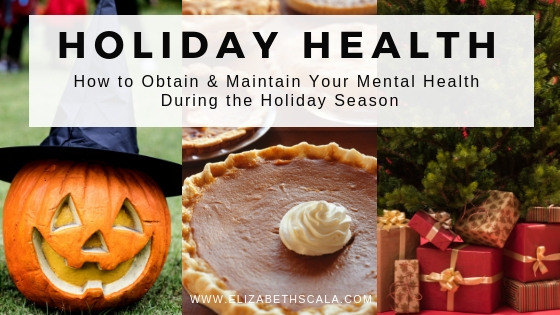 This information says a lot about our coping mechanisms when it comes to handling holiday stress and I think it’s time for a change. No – I know it’s time for a change. It’s time to take back our holidays and enjoy this precious time with our friends and family, but it will take a few adjustments to accomplish such a feat. With that in mind, I’ve compiled the five strategies I’ve been implementing for years now that have proven to be lifeboats amidst the seasonal flood. If money’s tight, tell people you won’t be buying gifts. If you’re busy and don’t have a ton of time to clean, stop trying to create a spotless house for visitors. If hosting parties or events sets your anxiety on fire then don’t do it. In other words, learn to say no. No to your family, friends, co-workers, and most importantly yourself. “Oh, but what if people talk?” Let them. Their opinion of you isn’t any of your business. Besides, if they’re going to talk about you because you’re trying to set the foundation for a better financial future or save yourself the burden of stress amidst celebration then it’s time to find new people, because they aren’t for you. Set specific days for shopping, baking, wrapping gifts, etc. Schedule in things like cleaning the house or running errands so you’ll always have plenty of time for the seemingly mundane, but also crucial aspects of day to day life. That way when things get crazy busy you’ll not only be prepared, but also not falling behind on the things that keep life in order. I totally understand that self-care can feel like a luxury item, but it isn’t. It keeps us fueled and functioning and is even more necessary during times of high stress. So take a bath, go for a long walk, breathe, call a friend, write down what you’re grateful for, and no matter what – DO NOT stop the healthy habits you’ve already set for yourself. Don’t sabotage yourself by going back to an unhealthy diet, quitting your exercise regimen, or drinking in excess. Our goal should be to go into the New Year as a healthier version of ourselves, rather than tearing ourselves down for three months and doing recon when the calendar hits January 1. Don’t have a self-care plan? Now is the best time to start one. I promise it will be the greatest gift you’ll ever give yourself! The holiday season is generally thought of as a time of love and togetherness, but for far too many people it’s a season of desperate loneliness. Some people live too far away from family to go home, while others skip out on parties and events due to enhanced anxiety during this time of the year. If you start to feel lonely please reach out. Attend a community event, religious service, or other social events. Volunteering is a good alternative for those who struggle with crowds or anxiety, as they get you around people and help you feel good about yourself without the stress that comes along with a traditional event. Don’t be afraid to ask for help when you need it. Everyone knows this is a stressful time of year and you’d be surprised how thrilled your family and friends will be to step in and take some of the load off. There you have it! I’d love to hear what you would add to this list!! Let us know below in the comments. And, thanks for reading! Wow Elizabeth, I haven’t been on the nurse blog site for some time. Glad to read your post. It has some good tips we all can use as the holiday season moves in. I will share with my social media connections. Take care. I’m a firm believer in “Happiness through Subtraction”. Less on your plate rewards you with greater fulfillment. The holiday season is a juggernaut that can either bring endless joy or exorbitant stress. I think you nailed it on the head. Our ability to maintain emotional and psychological flexibility is what can tip the scale in one direction or the other. So glad that you enjoyed the article!